Enterprise State Community College Grows Alabama Aviation College Footprint. Enterprise State Community College has announced a partnership with John C. Calhoun Community College in Decatur. This partnership expands the program that includes a facility at the Albertville Airport. The Albertville program began in 2009 and has graduated over 50 students that are finding jobs at places like BAE Systems and other aviation related companies. Enrollment numbers at the Albertville location were initially stymied because of the downturn in the economy and lower employment levels at local aviation companies in the area. This did not stop local efforts from Albertville Airport Manager Jerry Cofield and former State Representative Frank McDaniel from moving full bore with efforts to make the school a success. The new legislative delegation took the school on as project immediately after taking office. Within days of the election in November, Senator Clay Scofield and Representatives Kerry Rich and Wes Long initiated meetings with Dr. Nancy Chandler, president of ESCC and Dr. Frieda Hill, chancellor of the Alabama Community College System to discuss the school and its future. In late February, Sen. Scofield and Rep. Rich, along with Albertville Mayor Lindsay Lyons and others, met with Governor Bentley to discuss funding assistance to the school. Mayor Lyons and the City of Albertville committed $25,000 in free rent along with $112,000 that the former legislative delegation allocated in economic development funds to purchase new equipment at the school. Governor Bentley agreed that the school is an excellent component of his overall jobs-creation vision for Alabama and it should remain in Albertville. Initial reports in the media misrepresented the state school board’s decision to expand the program to Decatur.& The Decatur Daily and other media reported that the program at Albertville would close and move to Calhoun. The local legislative delegation and other officials are pleased to report that the program will remain in Albertville and has received a renewed commitment from Montgomery that the department of postsecondary education will support the school. Local efforts are underway to assist the school in promotion and student recruitment. The Marshall County Economic Development Council has committed resources to help promote the school to the local community. Matt Arnold, president of MCEDC, presented a marketing plan to Governor Bentley that includes recruitment of a local team to assist Dan Owen, director of the school, in career development at area high schools. Leaders from Marshall, DeKalb and Etowah Counties have agreed to assist in this effort. Workforce development is the key to sustained growth and a community’s economic viability. In his book, Outliers, Malcolm Gladwell states, “Achievement is talent plus preparation…the closer psychologists look at the careers of the gifted, the smaller role innate talent seems to play and the bigger role preparation seems to play.” Having the aviation school in Albertville gives the area’s youth the preparation they need for successful careers. “We are very interested in keeping this school in Albertville. We will do everything we can to keep it here and train workers in northeast Alabama. - Rep. Kerry Rich. “We commend Dr. Chandler and Chancellor Hill’s decision to keep the school in Albertville. I look forward to working with economic development officials from across North Alabama in recruiting more aviation related jobs. This training program is the tool that makes this happen. 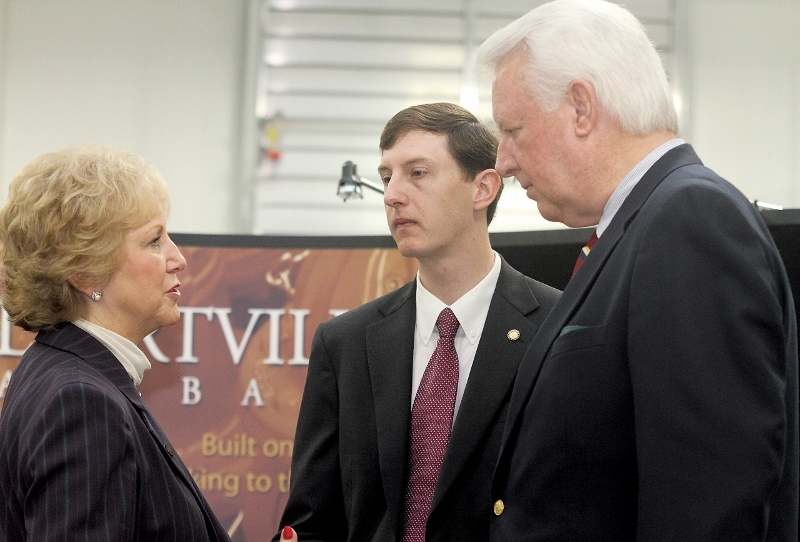 The community college system is an essential component in preparing the workforce that Alabama needs for the future. I support their efforts.” - Sen. Clay Scofield.